Athletes are looking for every competitive advantage they can use to help distinguish themselves from their competition and are constantly pushing the limits of their body. Technology is now doing the same. 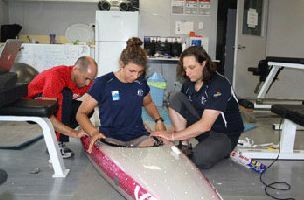 Australia’s 2012 Olympic Kayak team employed Creaform’s REVscan to create custom kayak parts (usually made of foam and wood for the seat of the kayak) known as a “fitout”. Although a fitout sounds like a simple piece of equipment, it can help competitors shave precious fractions of a second in competition. Ami Drory, a biomechanist at the Australian Institute of Sport (AIS) was in charge of enhancing the design of fitouts for kayakers in the canoe slalom event at the 2012 London Olympics. Previous methods of creating custom fitouts were not easily repeatable as large amounts of material, time and effort were wasted. “There can be a frustrating process of trial and error and wasted material before you get it right,” said Drory. Drory was tasked with creating around a dozen custom fitouts in a small time window. He wanted to create a time effective way of repeating custom manufactured parts. Drory would have to start with athlete’s bodies and boat frames and end with distinctive, unique kayaking equipment. The first step was to scan the athlete in racing position. Previous capturing devices were not able to accurately capture the detail needed to create custom fitouts. To tackle this issue, the AIS brought in Sébastien Dubois, an application specialist from Creaform. Dubois brought a REVscan with him to the AIS facility in Australia. Its compact nature made it easy to transport, handle and operate in an unfamiliar environment. The 3D scanner weighs just over two pounds, with a resolution of 0.004” and an accuracy of 0.05”. The REVscan was used at a distance of 12-inches, making ideal for accurate, up-close scanning. It’s perfect for natural contours, like on human bodies, and produces highly accurate and detailed results. Kayaker Jessica Fox (pictured) was scanned in race position by wearing a netting of position markers. Dubois and Drory created an initial digital model of this data. The scanning technology plotted approximately 3,500,000 polygons-worth of 3D points in around one hour. Another two-hour scan diagrammed the entire interior of Fox’s kayak. Next, using Creaform’s VXelements (which can fill in spaces in a digital model based on surrounding position points) Dubois created an STL file of the scans. These files were imported and edited in Geomagic Studio. Once in CAD format, the 3D scan data was used to enable precise modeling of the kayak fitout, which was perfectly shaped and customized according to each athlete’s unique body shape. Using this procedure, Dubois captured and processed 11 athletes’ scans in only three days. A remarkable feat of speed and precision. The question everyone wants to know the answer to is: will the enhanced kayak fitouts help the Australians medal at London this summer? Only time will tell. They should have a paddle up on their opponents! Canoe Slalom takes place from July 31, 2012 through August 5th, 2012.